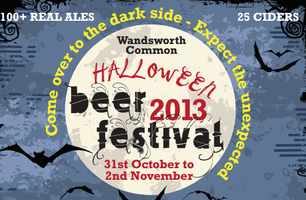 The Wandsworth Common Halloween Beer Festival is coming, straddling Halloween itself from Weds 30th October to Saturday 2nd November. The Wednesday night is a special preview event with food for £25 a head with all the beer you can drink (there's presumably ts & cs with this), otherwise just turn up and pay on the door (although reserving a place on Eventbrite gives you priority entrance). But anyway - Beer Festival! For Halloween! Do it!